Ronda is a city in the Spanish province of Málaga. 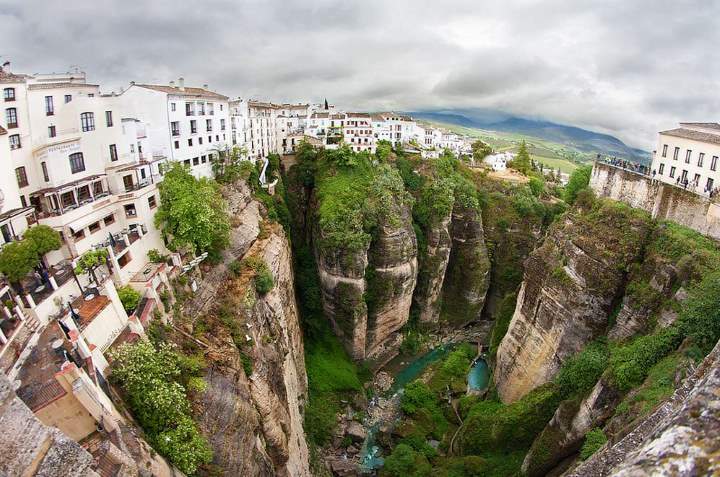 It is located about 100 kilometres (62 mi) west of the city of Málaga, within the autonomous community of Andalusia. Three bridges, Puente Romano (“Roman Bridge”, also known as the Puente San Miguel), Puente Viejo (“Old Bridge”, also known as the Puente Árabe or “Arab Bridge”) and Puente Nuevo (“New Bridge”), span the canyon. The term “nuevo” is a bit of a misnomer, as the building of this bridge commenced in 1751 and took until 1793 to complete. The Puente Nuevo is the tallest of the bridges, towering 120 metres (390 ft) above the canyon floor, and all three serve as some of the city’s most impressive features. The former town hall, which sits next to the Puente Nuevo, is the site of a parador, and has a view of the Tajo canyon. The “Corrida Goyesca” is a unique and historical bullfight that takes place once a year in Ronda in the Plaza de toros de Ronda, the oldest bullfighting ring in Spain. It was built in 1784 in the Neoclassical style by the architect José Martin de Aldehuela, who also designed the Puente Nuevo. The partially intact Baños árabes (“Arab baths”) are found below the city and date back to the 13th and 14th centuries. American artists Ernest Hemingway and Orson Welles spent many summers in Ronda as part-time residents of Ronda’s old town quarter called La Ciudad. Both wrote about Ronda’s beauty and famous bull-fighting traditions. Their collective accounts have contributed to Ronda’s popularity over time.